Sokoto is a city located in the extreme northwest of Nigeria, near to the confluence of the Sokoto River and the Rima River. As of 2006 it has a population of 427,760. Sokoto is the modern day capital of Sokoto State (and its predecessor, the Northwestern State). The name Sokoto (which is the modern/anglicised version of the local name, Sakkwato) is of Arabic origin, representing suk, 'market'. It is also known as Sakkwato, Birnin Shaihu da Bello or "Sokoto, Capital of Shaihu and Bello"). Being the seat of the Sokoto Caliphate, the city is predominantly Muslim and an important seat of Islamic learning in Nigeria. The Sultan who heads the caliphate is effectively the spiritual leader of Nigerian Muslims. Fulani rule under the leadership of Usman Dan Fodio started with the Jihad in the early years of the 19th Century. By 1809 most of Hausa kingdoms were toppled and replaced with Islamic Governments under a unified administration whose headquaters was at Sokoto. This continued up to the arrival of the British. The Sultanate of Sokoto was founded in 1804 when the Fulani nomads, headed by Usman dan Fodio (1754 - 1817), a religious leader, revolted against their haussa Overlords and took poweer. Their movement extended in the territory of what was to become Northern nigeria and Northern cameroon. remaining overlord of the whole Empire. Despite this the Sultanate rapidly became no more than a loose federation of Emirates, some of them, like Adamawa acting in fact totally independently. Usman dan Fodio (1754 - 1817), a religious leader, revolted against their haussa Overlords and took poweer. Their movement extended in the territory of what was to become Northern nigeria and Northern cameroon. remaining overlord of the whole Empire. Despite this the Sultanate rapidly became no more than a loose federation of Emirates, some of them, like Adamawaacting in fact totally independently. Sokoto had been used as early as October 1804 by the Shehu Usmanu Dan Fodiyo as the venue for the meeting with Galadima, Yunfa's Vizier. Subsequently, it was used by Muhammad Bello as a staging post for an attack on Dufua in the spring of 1806. Bovil suggested that the area/district may have been known as Sokoto as early as seventeenth century. In historical perspective, Sokoto was founded as ribat (military camp or frontier) in 1809 When Shehu Usmanu was at Sifawa. It later became the capital of the caliphate after Shehu's death. In the 1820s, Sokoto was at peak of prosperity coinciding with the peak of its `rulers' powers at the center of the caliphate, receiving annual tribute from all the fiefs before a long period of decline. The explorers Hugh Clapperton (1827) were highly impressed by this prosperity and its effects on the city. Clapperton noted the importance of Sokoto's close-settled zone around. The rivers, rather than long-distance trade. In the city's economy. The trade of Sokoto is at present inconsiderable, owing to the disturbed state of the surrounding country. By the time the explorer Heinrich Barth arrived in 1853 Sokoto was thinly inhabited and greatly dilapidated. Barth in 1857, estimated the population at only 20,000–22,000 but the market was still supplied and attended, and a thriving suburb outside the wall was more animated than Sokoto itself. Bovil aptly described Sokoto that is position was strong, steep escarpments from the east to the north-west and a small valley on the west and the south west protected it against surprised cavalry attacks. The town dominates the broad lowland where the two rivers, Rima and Sokoto meet, being the junction of roads from Gobir in the north. Kebbi in the south and Burmi Zamfara in the east. In the early 19th century, the town (Sokoto) was divided into wards. Such wards include Magajin Gari ward, Waziri ward, Sarkin Musulmi ward, Sarkin Adar ward, Magajin Rafi ward, Sarkin Zamfara Ward. Although at this time the wards were rounded with wall which was so small, and comprise of the mosques of Sultan Bello and Shehu, Sultan Palace and other building as well as the compound of Shehu. In 1818, the wall was extended up to the extent that it has gates that come in an and out of the Birni wall. Such gates are Kofar-Kade, Kofar-Kware, Kofar-Rini, Kofar-Dundaye, Kofar-Taramniya, Kofar-Aliyu Jedo, Kofar-Marke. The area of the present Sokoto was the home of many empires and Kingdoms of the pre-colonial western Sudan. These include Gobir and Kebbi kingdoms as well as the world renowned caliphate whose spiritual and political capital is the headquarters of the state. Following the conquest of the caliphate by the British in 1903, its various components were made autonomous and joined into the government of Northern Nigeria. 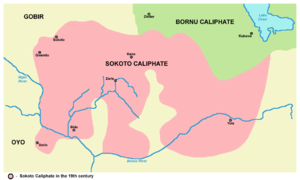 The northern region was thus made up of mainly parts of Sokoto caliphate and Kanem-Bornu Empire. This continued up to January 1967 when states were created to replace regional Governments by General Yakubu Gown. Sokoto became the headquarters of the north-western state created in 1967. In 1976 following the creation of Niger state out of North Western state, Sokoto state emerged with its headquarters. Yet in Sokoto, Kebbi and Zamfara states were carved out of Sokoto, in 1991 and 1996 respectively. Sokoto metro-polis has thus been the capital of various Governments since its establishment by Caliph Muhammad Bello in 1809. Tags: History Sokoto Gobir Kebbi Sokoto Caliphate Sultan Muslim.